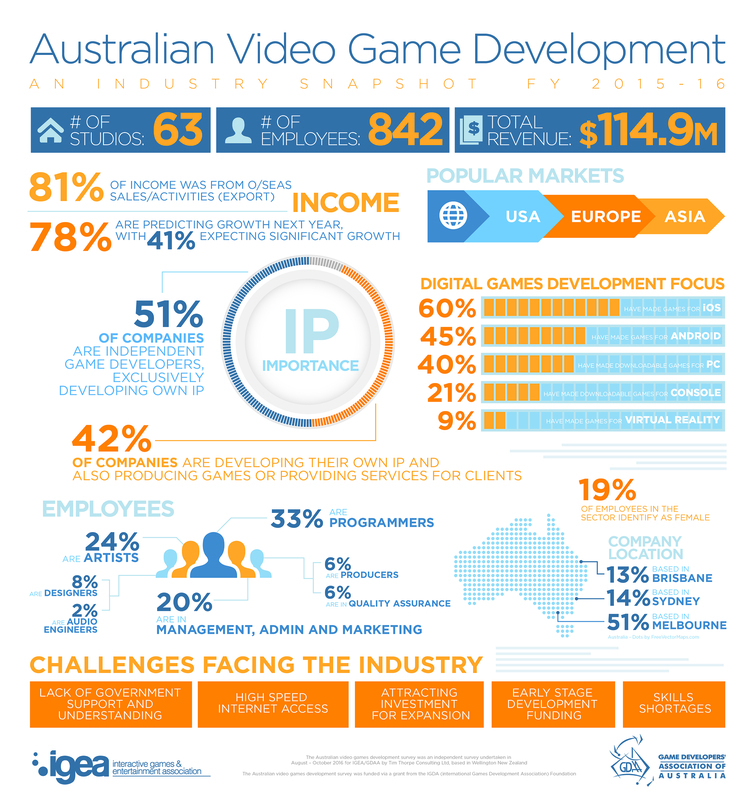 Sydney, Australia – 21 December 2016 – The Australian video game development industry has huge potential as a weightless and ‘clean’ export industry, an independent survey of local game developers has shown. 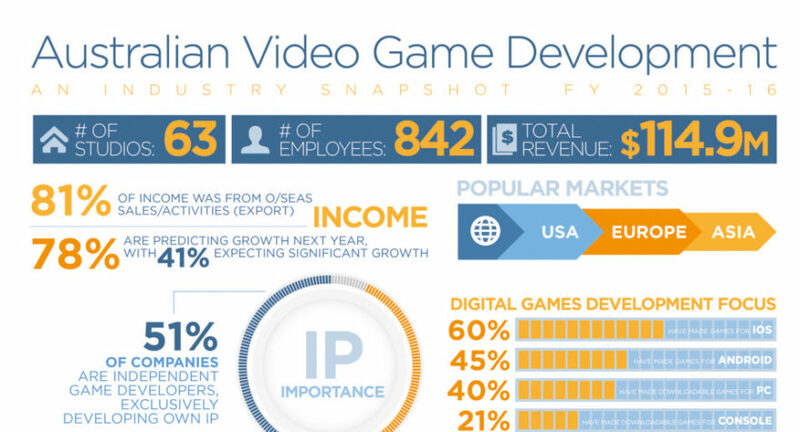 Australia’s game development industry earned $114.9 million in the 2015-16 financial year, with 81 per cent of revenue derived from overseas markets. According to the survey, Australian-developed games were popular in many markets, with the bulk of revenue earned from the United States, Europe and Asia. Intellectual property is of utmost importance to the local industry, with half of the respondents being independent game developers who exclusively develop their own IP. A further 42 per cent both develop their own IP, as well as provide game development services for clients. Seventy-eight per cent of Australian game developers project business growth in FY2016-17, with nearly two-thirds planning to employ additional staff. The employment opportunities are broad, spanning production, programming, art, quality assurance, audio, writing, design, management, administration and marketing. The industry employed 842 people in FY2015-16, of which programmers (33%), artists (24%) and management, administration and marketing (20%) made up the majority. While experience and some degree of training is useful at all levels, a relevant degree was particularly important for programmers. “The game development industry requires staff who are intensely creative, but who also have a highly technical skill set, often at the cutting edge of commercial technology. By supporting the industry and fostering this combination of skills, game development can contribute to the economy in a significant way,” said Tony Reed, CEO of the Game Developers’ Association of Australia (GDAA). Twenty-four per cent of respondents started their studio in 2012, and 14 per cent in 2014. The Interactive Games & Entertainment Association (IGEA) believes the establishment of the Interactive Games Fund under the then Labor government, and its subsequent axing in FY2014-15 by the Liberal government, played a major role in this spike and subsequent decline. Last year a Senate inquiry was held into the future of Australia’s video game development industry, championed by Senator Scott Ludlam. The inquiry report was delivered in April 2016 with bipartisan support and many recommendations were put forward to support and further grow the sector. To date, nothing has been enacted at a federal level. Consumers have embraced the digital delivery of games and in turn, digital game development is the major focus for the Australian game development industry, with respondents receiving most of their income from developing for the iOS (60%) and Android (45%) platforms, followed by downloadable PC games (40%). Revenues from virtual reality (VR) game development, a relatively new platform, were also being reported by a number of specialists (9%). The survey has shed light on some of the key issues affecting industry growth. The biggest challenge facing individual business growth is attracting investment for expansion as well as early stage development funding, with the industry finding both elements ‘stressful’. Skill shortages are also a problem. Internet access as well as limited government understanding and investment were key concerns at a sector level, with respondents calling for grants and funding support. Distance to market was also a concern. The Australian game development industry is concentrated in Melbourne, with 51% based in the Victorian capital, followed by Sydney (14%) and Brisbane (13%). 19% of employees in the sector identify as female. When seeking new employees, 34% of respondents consider experience, qualifications and diversity equally. The industry is developing games for an array of sectors, with clients ranging from game publishers, to museums, government departments and book publishers. The independent survey was distributed online to the video game development industry through IGEA and GDAA’s networks and social media marketing, a distribution list of over 225 ASIC-registered companies. Companies were included in the survey results if their annual turnover from video games production was $25,000 or greater in FY2015-16. Sixty-three companies that responded to the survey met this criteria. The Australian video game development survey was funded via a grant from the International Game Developers Association (IGDA). For media interviews with Ron Curry, CEO of IGEA, or to speak with an Australian game development studio, please contact Corrie McLeod (+61 419 526 848) or Amy Rathbone (+61 2 8016 2200) from Espresso Communications.